Ford says it will be mass-producing vehicles with full autonomy in five years. Ford Motor Co. said it plans to introduce an autonomous vehicle by 2021 for use in a ride-hailing or ride-sharing service. Ford said the vehicle would be “specifically designed for commercial mobility services” and built in high volumes. "Ford is going to be mass-producing vehicles with full autonomy in five years," CEO Mark Fields said on Tuesday at an event in Silicon Valley that was broadcast online. "There's going to be no steering wheel, there's not going to be a gas pedal, there's not going to be a brake pedal and of course a driver is not going to be required." To help accomplish that goal, Ford is investing in Velodyne, a company that makes lidar sensors used to detect objects around a vehicle, and Civil Maps, which has developed a more efficient 3-D mapping technology. Ford and Chinese search engine giant Baidu are investing $75 million each into Velodyne. Ford also said it has acquired an Israel-based company called SAIPS, which helps vehicles learn and adapt to their surroundings, and reached an exclusive licensing agreement with a “machine vision” company called Nirenberg Neuroscience. Ford said it is doubling the size of its work force in Silicon Valley to 260 people by the end of next year and increasing its office space there from one 30,000-square-foot building to three buildings totaling 180,000 square feet. 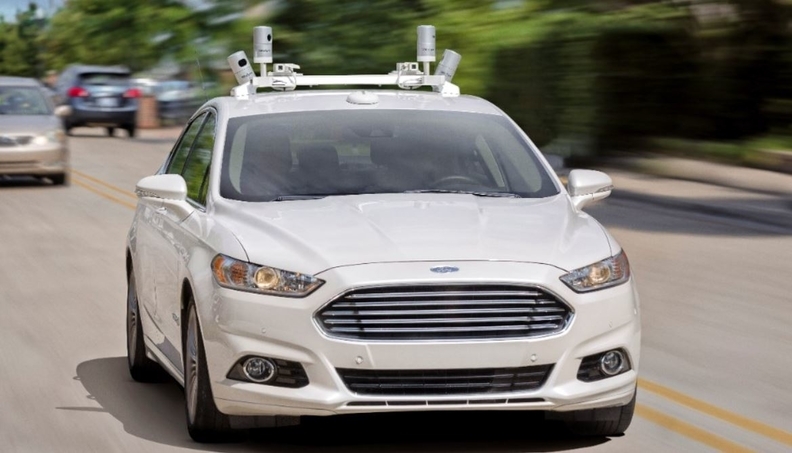 Fields said Ford’s first autonomous vehicle would meet what is known as Level 4 autonomy under a scale developed by SAE International that ranges from 0 to 5. By jumping immediately to Level 4 -- one step below complete autonomy in all driving environments (see graphic) -- and eliminating the steering wheel and pedals, Ford’s strategy differs from how General Motors and Tesla are rolling out the technology. "We abandoned the stepping-stone approach of driver-assist technologies," said Raj Nair, Ford’s product development chief, "and decided we were going to take the full leap to deliver a fully autonomous, Level 4 capable vehicle." Nair said he doesn’t expect autonomous vehicles to be available to individual consumers for "several years after their first introduction because the economics simply don’t make sense." But he said they can spread quickly among ride-hailing services by cutting the labor costs and commissions they have to pay. Fields said he expects autonomous vehicles to change society as much as company founder Henry Ford’s assembly line did more than a century ago. Said Fields: "This is a transformational moment in our industry, and it is a transformational moment in our company."